We mentioned earlier, some stats from the Adduplex report that had been teased on Twitter. These showed how the Windows Phone market is divided between speakers of different languages and how only 33% of users actually chose English as their primary language for the OS. Well we now have the whole report and it paints an interesting picture about Microsoft's mobile operating system. The data refers to the month of February and was collected worldwide across a variety of apps. 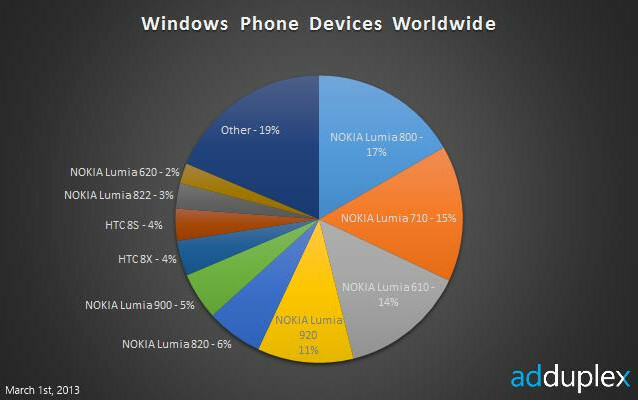 As you can see in the chart above Nokia's Lumia line pretty much dominates the marketplace with the Lumia 800 taking the lead at 17%. 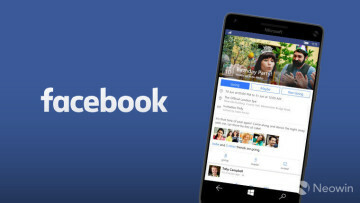 The new low budget Lumia 620 makes its first appearance while older Windows Phone 7 devices like the HTC Radar and Samsung Focus have been relegated to the "Other" category. Windows Phone 8 as a whole has also increased its market share versus Windows Phone 7, to 31% up from 26% last month. 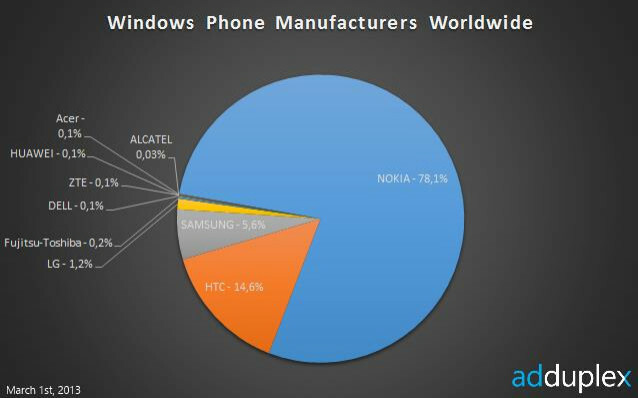 When it comes to manufacturers Nokia takes the lion's share with 78.1% of the total Windows Phones out there. 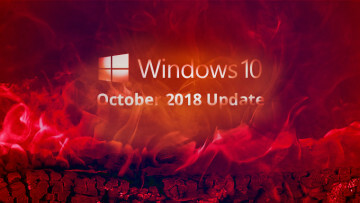 According to Alan Mendelevich from Adduplex it's interesting to note that smaller manufacturers like HTC and Huawei have actually seen a bit of an increase compared to LG and Samsung who have all but abandoned Windows Phone. In the U.S., the market is led by Nokia. 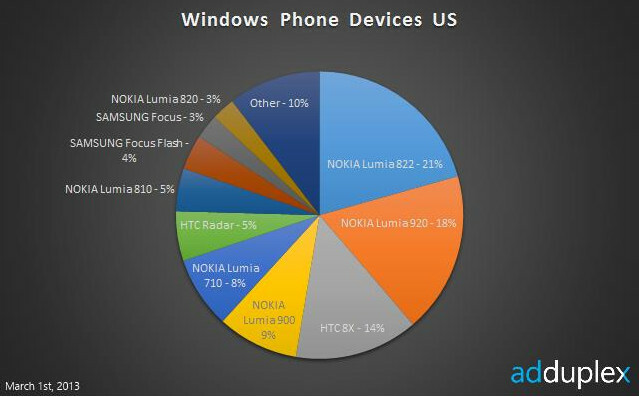 Worthy of note is that middle-end devices such as the Lumia 820 and its variants are the definite winners in the American market with 29%. That Nokia is leading is no surprise to anyone but HTC isn't doing too bad either with a combined market share of 26% , their high-end HTC 8X leading the way. All in all, it's been a pretty steady month inside the Windows Phone ecosystem with newer lower-end devices making a healthy appearance in the marketplace. If you want a bit more info and a few more charts be sure to visit the Adduplex blog tomorrow when the report is made public.